The front houses a smart looking grill which is surrounded by chrome bands from top and bottom. As Indians have an affinity for Chrome so the fog lamp area also has an interesting design of chrome surrounds. Both front and rear bumpers are redesigned for providing an edgy look but the side profile is still quite plain with decent looking alloys, a thick chrome band elevates the rear profile though. From the inside, the interiors get a big change in terms of feel but the theme remains the same with a centrally mounted dashboard. Now it gets a new instrumentation with digital tachometer, fuel gauge and readouts for odo with 2 trip meters but the useful fuel efficiency and distance to empty readouts are still missing, even the Renault Kwid gets them! The flat bottom steering feels good to hold with steering mounted controls but the infotainment unit doesn't get a touchscreen and has Bluetooth connectivity, USB and AUX inputs, even some features like climate control is missing which are now standard in compact sedans and premium hatchbacks. 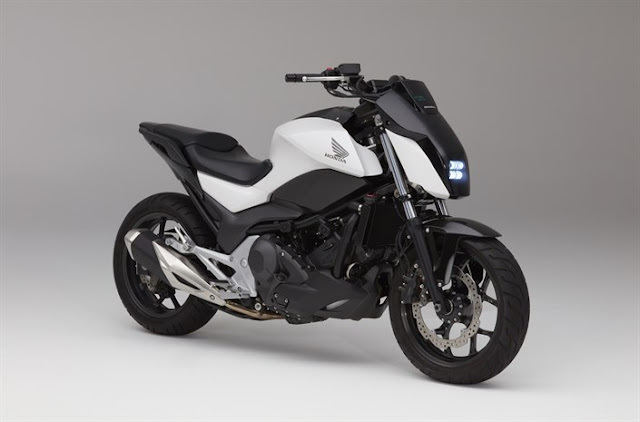 It gets electronically controlled ORVMs with turn indicators, a charging port, a big 13L cooled glovebox and reverse parking sensors. The upholstery is beige in color which gives more sense of space inside an already spacious cabin and the door pads have wood inserts which add to the premium feel of the cabin. The Toyota Etios platinum comes with a familiar set of engines, a 1.5 L petrol motor churning out 90 PS of max power and 132 NM of max torque at 5600 and 3000 rpm respectively and a 1.4 L diesel motor with max power of 68 PS of max power and 170 NM of max torque at 3800 and 1800-2400 rpm respectively. We had the petrol one which, nowadays, is gaining sales again over diesel counterparts. The earlier car's rubber engine mounts have been replaced by hydraulic ones which absorb vibrations from the engines better so naturally, the refinement has increased. The 132 NM of torque and a light clutch helps in city driveability as the low end punch is strong and leaving in higher gears doesn't upset the engine much. Toyota has redesigned the length of clutch pedal and added a turn over spring to make the clutch lighter. When you hit the highway, the story changes, after 120 kmhr, it looses steam and over 130, it becomes quite vocal for a petrol motor so, clearly, it is tuned for better low and midrange but not top end. The gearbox has positive shifts and the car returned 14.5 kmpl of overall mileage. 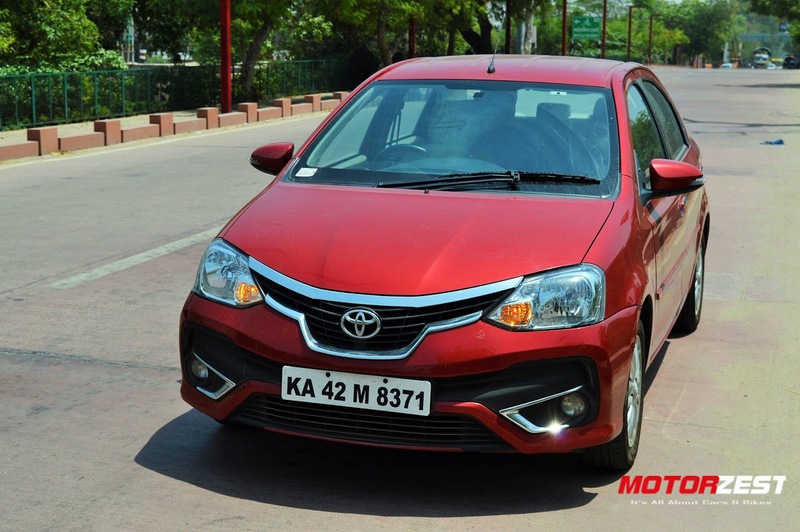 The chassis of Etios platinum has been strengthened for adding safety and the suspension is also stiffened so it doesn't sag as much as before while carrying full load. These changes made it a better handler than before. 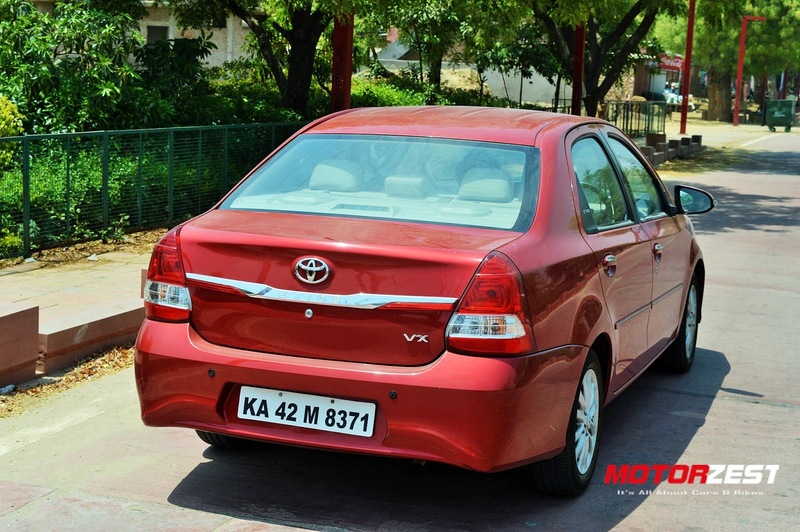 The ride quality feels stiff while driving at slow speeds but as you pick up the pace, it settles down making the car roll over potholes without much fuss. The suspension is very silent in its working and doesn't crash into potholes as easily making it one of the best compared to other compact sedans. However, body roll is still evident and mid corner bumps move the car a fair bit. 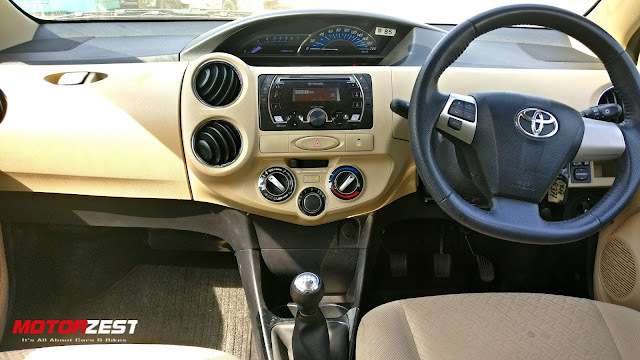 The flat bottom steering provides decent feedback at high speeds but it isn't as light as Honda Amaze or Hyundai Xcent while going slow so who likes some heft to the steering will like it and vice versa. How are space, comfort and safety? The biggest USP of this car is space. 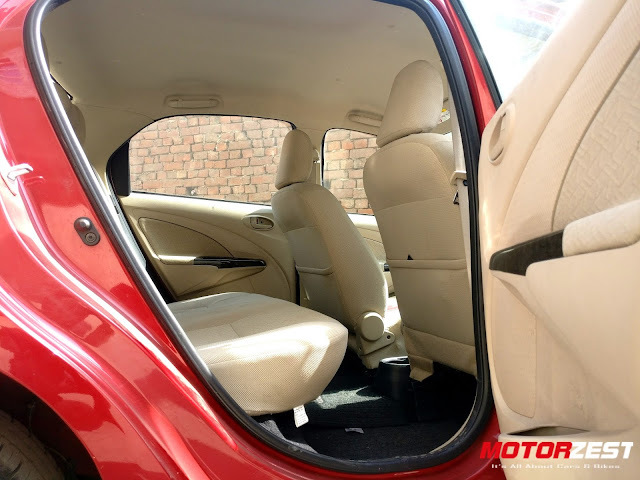 Be it front or rear, it provides a massive amount of knee room and is one of the few cars which can sit 3 adults at the rear seat in decent comfort due to its good shoulder room. The front seats are wide with good under thigh support as well. Same is the case with rear seats which now comes with a centre armrest. The armrest doesn't pop out from the seat when folded but is neatly flushed inside the seat for maximum comfort for the middle passenger but it eats into some boot space behind it which is still a massive 592L. If you want to stretch it even more then the rear seat folds to open up more room for the entire house to fit in! In terms of safety, it is very well loaded. Not only twin Airbags, ABS and EBD comes as standard across all models but it also features 2 ISOFIX child-seat mounts and a 3 pointed seat belt for 5th passenger for maximum safety. 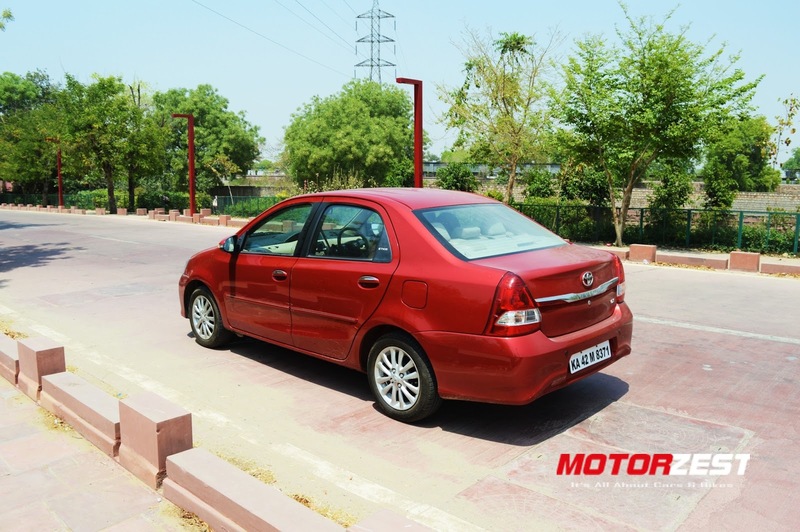 It also scored a healthy 4 stars in Global NCAP safety test which ensures the level of safety it provides. The Toyota Etios platinum goes from 6.54-7.85 Lakh for petrol and 7.67-8.98 Lakh for diesel models (ex-showroom Delhi) which is definitely more than some compact sedans in the market while missing out on some useful features. On the other hand, it provides one of the best chauffeur driven experience and safety, very cheap cost of ownership alongwith a reliable set of torquey engines. So, if you are in the market for a practical no-nonsense big sedan in a tight budget, the Etios platinum is definitely a very strong contender. Thanks for sharing such an informative blog. This car is the budget also. To know more about this car visit Eurobahnm. It is one Auto body repair shop which is having the variety of models of car. Lexus made the best 3 in the extensive premium vehicle class (LS460), moderate size premium vehicle (ES 350) and medium size premium multi movement classification (GX 470, RX).